Evidence suggests that physical activity may reduce the risk of developing breast cancer among post-menopausal women [1, 2, 3, 4, 5] and among the most physically active pre-menopausal women . The Nurses’ Health Study (n = 2,987)  and the Collaborative Women’s Longevity Study (n = 4,482)  found that women who reported at least 3 metabolic equivalent task (MET) hours per week had significantly lower risk of death from all causes and from breast cancer. 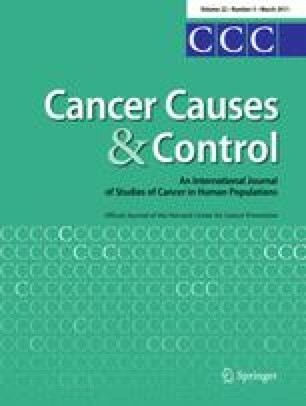 In two smaller cohorts of women recruited specifically because of prior early-stage breast cancer diagnosis, the Health, Eating, Activity, and Lifestyle (HEAL) study  and the Life After Cancer Epidemiology (LACE) study  (933 and 1,970 women, respectively), physical activity was shown to have a significant protective association with all-cause mortality. In these two studies, physical activity also tended to be associated with reduced risk of both recurrence and breast cancer death, which accounted for the majority of deaths. A recent report from the Norwegian Counties Study  reported a 64% decrease in all-cause mortality risk among post-menopausal breast cancer survivors in the highest versus lowest category of physical activity participation (recurrence was not examined). In a Canadian cohort of 1,233 women with incident breast cancer, risks of breast cancer death and death from all causes were also lower among the highest versus lowest quartiles of both moderate and vigorous intensity recreational activity. Additionally, pre-diagnosis recreational activity, particularly moderate intensity activity, had a beneficial association with survival after breast cancer . Little is known about the effect of change in physical activity level on breast cancer prognosis. While the HEAL Study  analysis revealed a higher mortality risk of women who decreased their physical activity level from the year prior to diagnosis to 2 years post-diagnosis, no studies have examined the potential effect of post-diagnosis change in physical activity. Proposed mechanisms by which physical activity (and/or physical activity adoption) may improve breast cancer survival include reductions in circulating concentrations of estrogen, insulin and related growth factors, and inflammatory factors [12, 13, 14]. The Women’s Healthy Eating and Living (WHEL) Study was a randomized controlled trial of the effect of a high-vegetable, fruit, and fiber diet on recurrence and overall survival conducted from 1995 to 2006 among 3,088 women who had completed treatment for Stage I (≥1 cm)–IIIA breast cancer . The low-fat, vegetable-rich WHEL dietary intervention did not produce significant differences in either breast cancer events (16%) or deaths (10%) from all causes compared to comparison conditions , except in a subset of women who were not experiencing hot flashes at baseline . We previously reported that while physical activity alone did not significantly predict breast cancer events or all-cause mortality among the 1,490 WHEL participants assigned to the control group, there was a cluster effect for physical activity combined with fruit/vegetable intake. A 50% reduction in mortality risk was observed among those who were highly physically active and ate five or more fruit/vegetable servings per day, regardless of adiposity . In this report of the full WHEL cohort, we tested the hypothesis that higher levels of baseline physical activity alone and 1-year increases in physical activity would be associated with a reduction in additional breast cancer events and death from all causes. Details of eligibility criteria, data collection, and breast cancer outcomes assessment and causes of death have been reported previously  and are briefly summarized here. The WHEL trial participants were enrolled at 7 study sites between 1995 and 2000. Eligibility criteria included diagnosis of primary operable invasive stage I (≥1 cm), II, or III and breast carcinoma within the past 4 years; age 18–70 years at the time of diagnosis; no current or planned chemotherapy; no evidence of recurrent disease or new breast cancer since completion of initial treatment; and no other cancer in the past 10 years. Informed written consent was collected, and the Human Subjects Committee of all participating institutions approved the study procedures, and the data are publicly available. Of the 3,088 WHEL participants, we required participants to complete physical activity assessments at both enrollment and at the 12-month time point. Accordingly, 727 of those in the WHEL Study were excluded from this analysis due to additional breast cancer events <1 year after randomization (n = 124), death <1 year after randomization (n = 2), loss to follow-up (n = 1), or incomplete physical activity data (n = 600). Of the remaining 2,361 women included in these analyses, there were 295 (12.5%) breast cancer events and 163 (6.9%) deaths from all causes over a median follow-up period of 7.1 years (range of 1.0 to 10.8 years) from enrollment into the trial. Physical activity was assessed by questionnaire at post-treatment baseline (at the time of enrollment into the trial) and at various follow-up points using a 9-item physical activity measure adapted from the Women’s Health Initiative (WHI) . The physical activity questionnaire assessed frequency, duration, and speed of walking outside the home and frequency and duration of participation in each of three intensity levels of exercise: mild, moderate, or strenuous (with example activities for each level). As previously presented , activity levels were converted into metabolic equivalent task (METs) min per week in accordance with Ainsworth’s compendium of physical activities : mild activity was assessed as 3 METs, moderate activity was assessed as 5 METs, and vigorous activity was assessed as 8 METs. For walking, slow, average, fast, and very fast were assessed as 2, 3, 4, and 6 METs, respectively. The physical activity measure was validated against an accelerometer and the widely accepted Physical Activity Recall (PAR) among a subset of 74 WHEL Study participants and was found to have validity and sensitivity comparable to that of the PAR . Compared to the accelerometer, the WHI physical activity measure did not provide a significantly different estimate of physical activity (+6 min or 4%, p = .95). At both the baseline and 1-year clinic visits, height and weight were measured using standard protocols and used to calculate body mass index (BMI, kg/m2). Breast cancer characteristics (stage, number of positive lymph nodes, treatment) were verified using medical record review. Questionnaires or interviews were used to assess demographic characteristics (e.g., age, race/ethnicity, and education level), reproductive history (menopausal status, presence/absence of hot flashes), smoking status, and alcohol intake. The Rand SF-36  was used to obtain measures of self-rated health and pain. Self-rated health was obtained from the single SF-36 item (“Would you say your health is…” with responses of “excellent,” “very good,” “fair,” and “poor”) then categorized as “poor/fair” vs. “good/very good/excellent.” Pain was assessed using the SF-36’s bodily pain subscale, which consists of two items—one assessing severity of pain and one assessing the degree to which pain interfered with daily work (either inside or outside the home). The reference period for both items was the past 4 weeks, and participants were asked to respond using a 5-point Likert scale. The two item scores were combined and adjusted for subscale score with a potential range of 0 (worst possible pain) to 100 (complete freedom from pain). Primary study end points for the WHEL Study were  breast cancer events, defined as the combined outcome of invasive breast cancer recurrence (local/regional or distal) or new primary breast cancer and  death due to any cause. Details regarding outcomes assessment have been published . Briefly, during semi-annual telephone interviews, clinical staff queried participants about occurrence of outcome events, any hospitalization, or new or current medical diagnoses. Staff then conducted confirmation interviews for any report of a breast cancer event or death for which medical records and death certificates were obtained, and data were confirmed at study end for >95% of participants. Follow-up time was censored at the time of the participant’s death, at the last documented staff contact date, or at the study completion date (June 1, 2006). The breast cancer event-free interval was defined as the time from date of enrollment (March, 1995–November, 2000) to development of an additional breast cancer event or study completion. The death-free interval was defined as the time from enrollment to reported/confirmed death or study completion. Energy expenditure was calculated separately for mild activities (MET-level < 3.0), moderate activities (MET-level 3.0–5.9), and vigorous activities (MET-level ≥ 6.0). A variable was also created for moderate-to-vigorous physical activity (MET-level ≥ 3.0), which was then used to create a dichotomous variable (“meeting PA guideline”) based on a cutoff of 10.0 MET-h/week, which equates to 150 min/week of moderate-pace walking or the equivalent amount of other exercise durations/intensities. This cutpoint is consistent with American College for Sports Medicine’s (ACSM) current aerobic activity recommendation for adults aged ≥65 or for those aged 50–64 years who have chronic conditions . The following variables were created to describe the change in physical activity from baseline to 1 year: change in adherence to guidelines, change in total physical activity (MET-h/week), and change in moderate-to-vigorous physical activity (MET-h/week). Univariate analyses were used to define quintiles of baseline physical activity (both total and moderate–vigorous) and change in total and moderate–vigorous physical activity from baseline to 1 year. Potential covariates included age categories (<44, 45–54, 55–65, and >65 years), race/ethnicity (non-Hispanic white, African-American, Hispanic, Asian-American, and other), education (college graduate: yes, no), fruit/vegetable consumption (<5 servings per day or ≥5 servings per day, excluding potatoes and iceberg lettuce), menopausal status (pre-menopausal, peri-menopausal, and post-menopausal), smoking status (current, past, and never smokers), alcohol intake [none, 1–19 g/day (equivalent to <2 drinks/day), and ≥20 g/day], hot flashes at baseline (yes, no), and obesity status as normal weight (<25 kg/m2), overweight (25–29.9 kg/m2), or obese (≥30 kg/m2). Cancer treatment and tumor characteristics included chemotherapy use (yes, no), tamoxifen or other anti-estrogen use (yes, no), tumor type (either or both lobular and ductal invasive, none), tumor differentiation (well, moderate, poor), and cancer stage. Given that recruitment occurred from 1995 to 2000, use of aromatase inhibitors was negligible among WHEL Study participants and is therefore not included as a covariate. Cox models were used to determine both unadjusted and adjusted associations between each of the predictor variables and each of the two outcomes (additional breast cancer events, all-cause mortality), and chi-square tests were conducted to examine the relationship between physical factors (BMI, cancer characteristics, self-rated health, bodily pain) and adherence to physical activity guidelines. Kaplan–Meier plots were use to plot all-cause mortality stratified by (a) baseline physical activity and, in a separate plot, (b) change in physical activity from baseline to 1 year. All tests were two-sided and analyses were conducted in SAS version 9.1 (Cary, NC). The cohort for these analyses consisted of 2,361 WHEL Study participants who were alive and recurrence-free at 1-year follow-up and had completed the 1-year physical activity questionnaire. Of these, 295 later experienced an additional breast cancer event and 195 died of any cause. Baseline characteristics of the total cohort of 2,361 women, stratified by baseline adherence to physical activity guidelines, are shown in Table 1. Approximately one-half of the participants were under 55 years of age, college graduates, and overweight or obese (BMI ≥ 25.0 kg/m2). Almost 90% were non-Hispanic white and 81% were post-menopausal at baseline. Baseline physical activity level ranged widely with the average participant reporting 14.9 (SD = 14.7) MET-h/week of physical activity. Moderate–vigorous activity accounted for 80% of total activity. Approximately one-half of participants were meeting physical activity guidelines at baseline and at 1-year follow-up. Participants who met physical activity guidelines at baseline were slightly older, leaner, less likely to be post-menopausal, less likely to smoke cigarettes or to have formerly smoked, and more likely to be non-Hispanic white and to have a college degree (p < .05 for all) than those who did not meet the guidelines. They also had a lower tumor stage at the time of breast cancer diagnosis, were less likely to have received chemotherapy, had fewer positive lymph nodes, and were more likely to use anti-estrogens (p = .05 for all). Of the 1,175 participants who were meeting the physical activity guideline at baseline, the vast majority (n = 962; 82%) were still meeting the guideline at 1 year. Of the 1,186 women who were not meeting the guideline at baseline, 899 (76%) were still not meeting the guideline at 1 year. Neither baseline physical activity nor baseline-to-1-year change in physical activity was significantly associated with additional breast cancer events. It was observed that those in the highest quintile of moderate–vigorous baseline physical activity had a 33% fewer additional events compared to those in the lowest quintile (p < .05). Given that the trend across quintiles was not significant, this may be the result of type I error. Alternatively, these observations may indicate a threshold effect, so that physical activity has a protective effect on additional breast cancer events only when the activity is performed at sufficient intensity and in relatively high amounts. Of the 1,186 women who were not meeting physical activity guidelines at baseline, only a very small number (n = 213; 4.1%) increased physical activity and met guidelines at 1 year. Unexpectedly, this group was associated with higher risk of additional breast cancer events (p = .04), although as such an increased risk was not observed when the outcome was mortality, this finding might be an artifact. Baseline physical activity was associated with reduced mortality risk (Table 2). Women who met physical activity guidelines for aerobic activity at baseline experienced a 35% reduction in risk of mortality relative to those who did not meet the guideline (see Fig. 1a for Kaplan–Meier curve). Similarly, those in the highest quintile of total physical activity (≥24.7 MET-h/week, or the equivalent of at least 60 min of brisk walking, 5 days per week) experienced a 53% mortality risk reduction relative to those in the lowest quintile. The association was even more pronounced when physical activity was limited to that of moderate or vigorous intensity, with those in the most active quintile at 61% lower risk than those in the least active category. Only one significant association was observed for baseline-to-1-year change in physical activity and all-cause mortality. Those women who were meeting physical activity guidelines both at baseline and at 1-year follow-up experienced a 40% reduction in mortality risk (see Fig. 1b for Kaplan–Meier curve). Those who were meeting physical activity guidelines at only one time point fared no better than those who were meeting the guidelines at neither baseline nor 1-year follow-up. The observed association between higher baseline physical activity and lower all-cause mortality could be an artifact caused by low-baseline physical activity among women with latent disease. To address that issue, we re-ran our adjusted models to the data after excluding 62 women for whom deaths, additional breast cancer events, or censoring occurred within 24 months of randomization. This resulted in a reduced cohort of 2,299 participants, including 122 all-cause deaths. Results were highly comparable to those in Table 2 and are therefore not presented. Based on the previous published finding that, among WHEL Study control group participants , physical activity was only associated with improved outcomes among women who also reported high fruit/vegetable intake (≥5 servings/day), we tested the full sample (control and intervention women) for such a relationship. No interaction was observed; therefore, the presented findings include fruit/vegetable consumption as a first-order covariate, but not as part of an interaction term. WHEL Study participants were recruited up to 4 years after diagnosis. To address the possibility that it was the physical activity level shortly after diagnosis that mattered, we conducted a sensitivity analysis using only the 1,071 women who were diagnosed <2 years prior to randomization. The only result to change was that meeting physical activity guidelines at baseline was now associated with reduced breast cancer events (HR = 0.71; 95% CI: 0.51, 0.98; p = .04). Similarly, removing low-risk women (i.e., Stage I) from the analysis reduced the sample size to 1,404 breast cancer survivors. This subgroup analysis did not alter effect sizes, however, it reduced study power to identify those effect sizes as significant.